Tremors are one of the more common symptoms of multiple sclerosis. This uncontrollable shaking can be especially bothersome, embarrassing, and debilitating at times, but there are ways to help manage it. When tremors in multiple sclerosis occur, which they do in about 75 percent of patients with MS, they tend to be mild and transient. However, some people experience more severe shaking called gross tremors, which can be severe and debilitating. Tremors in multiple sclerosis and spasticity are not the same. While the former involves shaking, the latter refers to involuntary muscle spasms and feelings of pain and stiffness that may be mild to severe. Spasticity most often occurs in the legs, although it can present in and round the joints and may even affect the vocal cord muscles. Tremors in multiple sclerosis typically are one of three types. All of them are associated with damage (demyelination) along the nerve pathways that are involved with coordination of movement. Demyelination is the loss of the protective coating (myelin) on nerve fibers, which results in an interruption of nerve signals from the brain to the muscles. Intention tremor, which is the most common type. 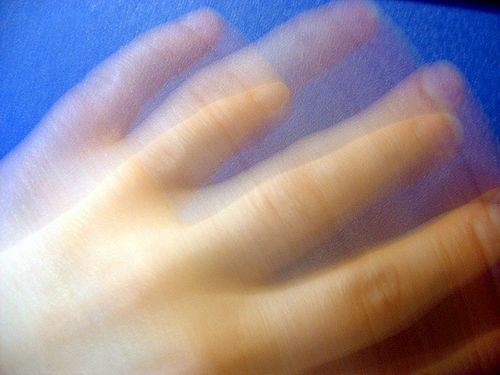 People with intention tremor will shake when they reach for or pick up an object or more their foot to a precise spot. If you experience intention tremor, you know how frustrating it can be. Postural tremors occur when you are standing or sitting but not when you are lying down. These tremors occur because your body is attempting to fight gravity. In addition, a condition known as dystonia frequently occurs along with MS-related tremor. Dystonia is characterized by involuntary muscle contractions that result in abnormal postures or slow, repetitive movements. The movements can be painful and may affect one or more muscles throughout the body. A new study (May 2015) published in Multiple Sclerosis explored the presence of dystonia in patients with MS tremor. Considering the 54 participants in the study, the authors found that upper limb dystonia is common among MS patients, indicating that the pathophysiology of tremor in multiple sclerosis involves very specific sites in the brain (the “cerebello-pallido-thalamo-cortical network”).